During the past 3 years, more than 350 AALL volunteers have contributed their time as part of their state working group to help AALL create the first-ever National Inventory of Legal Materials. After countless hours of research, calls to government offices and conversations with colleagues to discuss their findings, volunteers created state inventories that contain invaluable information about more than 7,000 legal titles from all three branches of government in print and online. This fall, the AALL Government Relations Office and Digital Access to Legal Information Committee (DALIC) completed our preliminary analysis of the inventories and posted the results on AALLNET. We’ve also linked to each of the 51 inventories so that anyone can see the underlying data. Volunteers are currently working to complete the federal inventory, which includes information from all three branches of government such as decisions, reports and digests (Executive); court opinions, court rules, and Supreme Court briefs (Judicial); and bills and resolutions, the Constitution, and Statutes at Large (Legislative). Most recently, the GRO has been working with library students at Catholic University who each “adopted” two agencies and spent their fall semester inventorying agency legal materials and answering a series of questions about each title as part of their Legal Literature course. Thanks to their hard work, we have another 300 titles to add to the federal inventory. AALL’s Native Peoples Law Caucus is also working with us on ways we could develop a tribal inventory. In addition to providing a comprehensive look at the legal materials each branch of government makes publicly available, the inventories assist us in identifying trends and problems. For example, we learned from the state inventories that eight more states have designated at least one online primary legal resource as official, bringing the total number doing so to 24. We also found that nearly 30 states have included some type of copyright notice on one or more of their online primary legal materials. Most recently, thanks to the Catholic University students’ work, we discovered that the Internal Revenue Service (IRS) had included a copyright notice on every page of their website. We immediately recognized this as violation of 17 USC §105, which states that, “Copyright protection under this title is not available for any work of the United States Government.” I contacted the IRS with my concern earlier this month, and a few days later after some discussion, the notice was removed. 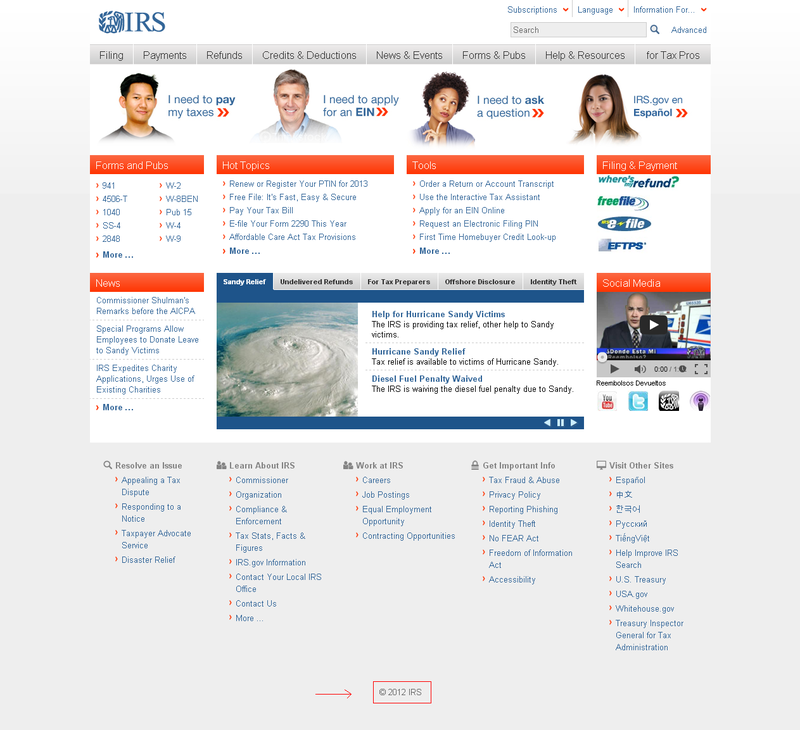 IRS officials recognized the problem as an oversight during the design process of the new IRS website, which launched this summer. Had our dedicated students not noticed this copyright symbol as they were inventorying IRS legal materials, the IRS website would still be carrying the misleading copyright notice. The Government Relations Office is grateful to the hundreds of volunteers who have made this project possible. If you’re interested in contributing to the Federal or Tribal inventory, please contact AALL Public Policy Associate Elizabeth Holland. As a candidate and first term president, Barack Obama promised to make transparency one of the “touchstones of this presidency.” He pledged to make bills available online for five days before he signed them. He committed to protecting the openness of the Internet by supporting net neutrality. He assured that he would go over earmarks line by line to make sure money was spent wisely and called for reform. On his first day in office, the President clearly signaled that open government would be a hallmark of his presidency, issuing a Memorandum on Transparency and Open Government and a Memorandum on the Freedom of Information Act, which ordered federal officials to “usher in a new era of open government” and “act promptly” to make information public. Despite progress in some areas, the Obama Administration has demonstrated that ensuring transparency requires a significant investment of energy and resources and the ability to shift a government culture that often heavily relies on secrecy. While significant progress has been made to improve FOIA administration, strengthen protections for whistleblowers and modernize records management, there is a long way to go before this administration can be made the gold standard of government openness. On Monday, the Advisory Committee on Transparency (ACT)* hosted a public event on Capitol Hill to examine the efforts of the Obama Administration, titled “Transparency and the Obama Presidency: Looking Back and Looking Forward”. Four panelists were invited to rate the president on the culture of openness and transparency in his White House, including Anne Weismann, Chief Counsel at Citizens for Responsibility and Ethics in Washington (CREW); Hudson Hollister, Executive Director for the Data Transparency Coalition; Josh Gerstein, White House Reporter at POLITICO; and Daniel Schuman, Policy Counsel at the Sunlight Foundation and Director of ACT, who moderated the panel. Together they painted a murky picture of progress tinged by disappointment. Panelists pointed to a few well intended yet poorly executed attempts at greater transparency, including the ban on hiring individuals from agencies that they have lobbied within the past two years. As Weismann pointed out, often the individuals who are most committed to improving agency operations like public interest lobbyists are precluded, while individuals who are not registered lobbyists but are indeed paid for the work can easily access the revolving door. Another point of contention was access to government data. While more data is being published in a usable format, often the most important and useful data is not. Panelists also lamented the 2010 departure of Norm Eisen, known as the White House “ethics czar,” who had the ear of the president and displayed an unfailing commitment to improving open government policies. Gerstein described a “feedback loop” under Eisen in which the White House could easily be reached with complaints about what wasn’t working, but said the loop had since stalled or broken. One strong beacon of hope exists in the National Archives and Records Administration (NARA), in large part thanks to important steps taken by Archivist David Ferriero to address the key issues in electronic records management. In November 2011, President Obama tasked NARA with creating a new Records Management Directive to establish a robust 21st century framework for managing Federal records, calling proper records management “ the backbone of open Government.” Released on August 24, the new Directive is an important step forward to ensure preservation and permanent public access to federal agency records in electronic formats. The Directive requires agencies to transition to electronic recordkeeping “to ensure transparency, efficiency and accountability,” a goal which promotes the open government commitments in President Obama’s Open Government Directive. Agencies are required to move to electronic recordkeeping of all permanent electronic records by 2019 and transition to electronic recordkeeping of email by 2016. In addition, the Archivist convened the first meeting of Senior Agency Officials last week to focus on role they play in supporting individual records management programs in Federal agencies. Each year, AALL recognizes individuals and/or groups with our Public Access to Government Information (PAGI) and Robert L. Oakley Advocacy Awards. If you would like to nominate an individual or group for one or both of these prestigious awards, please send your nominations to Government Relations Committee chair Melanie Knapp by February 1, 2013. Past recipients include Michele Timmons, Revisor of Statutes, Minnesota Office of the Revisor of Statutes and Chair of the Drafting Committee for the Uniform Electronic Legal Material Act (2012); Citizens for Responsibility and Ethics in Washington (CREW) (2011); the Legal Information Institute (LII) at Cornell Law School (2010); the Sunlight Foundation (2009); and Gary Bass, Executive Director, OMB Watch (2008). Additional past recipients include Barbara Bintliff, Reporter for the Drafting Committee for the Uniform Electronic Legal Material Act (2012); Joan Bellistri, Director and Law Librarian, Anne Arundel County Public Law Library in Annapolis, MD (2011); the Ohio Regional Association of Law Libraries (ORALL) County Law Library Special Interest Group (2010); and Richard J. McKinney, Assistant Law Librarian, Federal Reserve Board Law Library (2009). Both awards will be presented during the Annual Public Policy Update at the 2013 AALL Annual Meeting in Seattle, WA. Learn more about the PAGI and Oakley awards, as well as the advocacy work of the Government Relations Committee and the Government Relations Office, on our homepage. This is the second in a series of interviews with the 2012-2013 chairs of AALL’s three policy committees: the Copyright Committee, Digital Access to Legal Information Committee, and Government Relations Committee. The DALI Committee was instrumental in analyzing the data from AALL’s National Inventory of Legal Materials. Can you explain how people can use the new chart? The new chart shows state trends concerning online legal materials with respect to authentication, official status, preservation, permanent public access, and copyright. The information contained in the chart can be used to draw conclusions about how a particular state treats online legal materials. The material contained in the chart would provide excellent source material for articles on the importance of official, authentic, permanent online legal information and the need to enact UELMA particularly in states that have begun to replace print legal materials with online materials. The chart provides links to the underlying inventories of legal materials in each state. The committee hopes to turn the chart into a wiki in the future to enable librarians in each jurisdiction to keep the char up-to-date. Please tell us about some of the initiatives that the DALI Committee is working on this year. The DALI Committee has three subcommittees that do the work of the committee. One subcommittee is devoted to citation reform and is working on a new edition of AALL’s guide to universal citation. The second committee is concerned with the National Inventory of Legal Materials.. In addition to the inventory chart, the subcommittee has been working on definitions of important terms like preservation, permanent public access, copyright, and official statusl. The committee is also exploring working with the Legal Information Preservation Alliance (LIPA) and the Technical Services SIS committee on preservation. The final DALIC subcommittee is working on best practices criteria for online legal information. What is the committee doing to support the Uniform Electronic Legal Material Act? Members of the committee are working on articles supporting the enactment of UELMA in individual states. These articles will be published in state bar journals, in Spectrum and Law Library Journal, as well as online sources, such as LLRX.com. Committee members are also supporting the adoption of UELMA in their own states. What resources would you recommend to AALL members who would like to learn more about authentication, permanent public access, preservation and citation issues? There a web page on access to legal information that contains links to the text of UELMA, as well as to materials on citation reform, guidelines for evaluating government information on the web, and principles and core values concerning public information on government web sites. There is also on that page a link to a web page on digital authentication that contains the 2011-2012 State Legal Inventories Chart, as well as the 2009-2010 state summary updates on authentication of online legal resources. Finally, for those involved in enacting UELMA in individual states, there is a UELMA page in the Advocacy Toolkit. This page contains many resources that would be very helpful in advocacy efforts concerning UELMA. You are currently browsing the AALL's Washington Blawg blog archives for December, 2012.